Heat walnuts in olive oil for 3-5 minutes over medium-low heat, until toasted. Strain nuts from oil and cool. In a food processor add basil, garlic, pecorino, lemon, salt, pepper and cooled walnuts. Pulse to mix. Continue mixing as you slowly drizzle in cooled olive oil until combined. 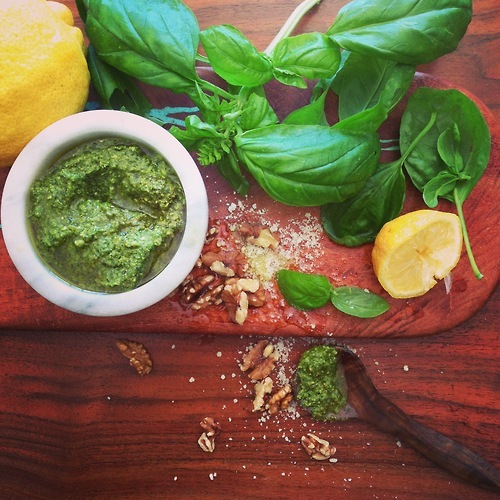 Toasting the walnuts brings a depth of flavor that makes this pesto unique. Delicious with crudite, on grilled salmon or with brown rice pasta.